Sanoe Lake of Kauai plays "Surf Girl" Lena. She is one of many local surfers and actors who have won parts in the film. 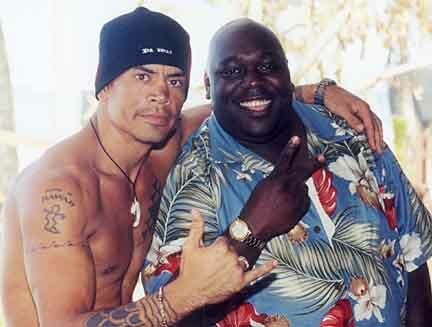 Faizon Love -- a k a Dr. Love or Mr. Love -- is hanging out on a lanai that overlooks the world's most famous surf spot, Banzai Pipeline. Just inside the beachfront home on Ke Iki Road, a couple of guys play pingpong while a nearby stereo is blasting an incomprehensible song by Guttermouth. Love, in gaudy aloha shirt, shorts and bare feet, is smiling so wide, you'd think his lips would split at any moment. "Life is good, man," he says. "Life is very, very good. I'm in Hawaii, acting in a movie about surfing produced by Brian Grazer, surrounded by beautiful women, and I don't even swim! Oh yes, thank you, Lord." On the beach below, a scene is being filmed for the $30 million Imagine Entertainment production -- technically dubbed the "Untitled Surf Movie," though everyone calls it "Surf Girls." A mock judges' tower has been erected, along with booths where the "competitors" sign up or rest before their heats. And though the beach is lined with photographers using absurdly long lenses, the action this day is on the sand, not in the water. All these photographer-extras are doing is setting the scene. Line producer Louis Friedman -- the bottom-line guy -- is walking back and forth along the beach listening to his headphones while carrying on a conversation about something requiring immediate attention. Friedman looks almost dapper in pressed shorts and shirt, with nary a hair out of place, but director John Stockwell could be mistaken for a fatigued, former lifeguard: He's wearing surf shorts with no shirt and has a deep tan to match his messy, sun-streaked hair. Nearby, executive producer Grazer, in slacks, T-shirt and thin gold chain -- fresh from winning the Golden Globe for Best Drama for "A Beautiful Mind" -- waits for the next scene to be shot: Kate Bosworth and Sanoe Lake carry their surfboards to a registration table. The shot requires several takes and nearly an hour to complete. The modestly budgeted film -- an average Hollywood production under a studio banner costs $40 million-plus -- is about four women, ages 14 to 23, competing in the male-dominated world of professional surfing. All 42 days of shooting will take place in Hawaii, primarily on Oahu, with possible side trips to Maui. Filming began Dec. 12 and wraps Feb. 13. Of the film's 35 speaking roles, as many as 20 are local talent, unusually high for visiting productions, Friedman said. Director Stockwell's vision was to give the film as much local flavor as possible. When the production team came to Hawaii in October to scout, Stockwell said he urged bosses and subordinates "to immerse themselves in the North Shore culture." Friedman believes the production has hired more local crew -- nearly half of the 90 total -- than any major production that has filmed in Hawaii. The production has also hired locals as department heads, including in special effects. "In general, the challenge of hiring a local crew anywhere has always been that they wear too many hats because that's necessary for them to work," Friedman said. "The problem is then they don't develop an expertise in one area." 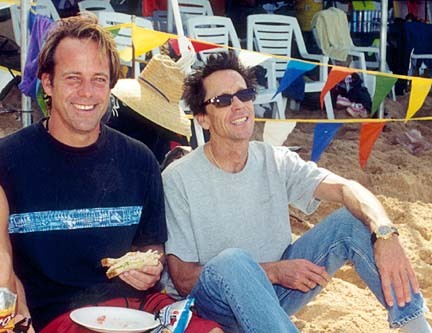 Director John Stockwell, left, and executive producer Brian Grazer stopped for lunch. In some cases, local hires don't work out as department heads, forcing Friedman to find replacements from Los Angeles. "There's also a difference in work ethic, even with (production crew members) who left L.A. 20 years ago, and I don't mean that negatively," he said. "Why did they leave the fast-paced Diamond Lane environment of L.A. for Diamond Head? They wanted a more laid-back life. It makes it hard to get back up to speed when you only have one gear." But the film is under budget and three days ahead of schedule. Friedman said they're considering traveling to Tahiti to film a surf contest there in May. Shooting on water, which Friedman described as "a moving platform," is always more expensive than a land-based film. "This movie involves a great deal of surfing," he said. "For every one person in the water, we may have as many as four people on jet skis." The film is a rarity in that it focuses on women athletes. "Brian Grazer has an uncanny sense to select material that has a hook which Hollywood hasn't exploited," Friedman said. "'Surf Girls' attempts to reach a niche, a demographic we haven't seen before: a surf film with women at the center and a story done in a very hip, millennium way, with cutting-edge photography and music." Love, who began his show-business career as a stand-up comedian at 15, has appeared in several films, including "The Replacements" and 1992's animated feature "Bebe's Kids." He said he jumped at the chance to work with Grazer. "When I told them I couldn't swim, they asked if I would take swim lessons, and I said, 'Hell yes,'" said Love, who plays an NFL player in town for the Pro Bowl, who's staying at the Lanakai (sic) Hotel (actually the Ihilani Resort & Spa at Ko Olina). The surf girls are hotel maids recruited to give the players surf lessons. Kala Alexander, left, plays a surfer; Faizon Love plays a football player. Brian Keaulana taught Love to swim and surf in Waikiki before filming started. "Barry's gotten me up on a board a few times," said Love, who was born and raised in San Diego and now lives in Laguna Beach. "See, when black people go to the beach, we stay in the parking lot. We saw 'Jaws' once, so we know they're out there, no matter what anyone says." Being cast as one of four leads in the film is "a dream come true" for Kauai-born Sanoe Lake, 22, a highly regarded surfer in her own right. "I love acting and I love surfing, so this is perfect for me," she said. Lake's been allowed to do her own surfing as "Lena" in the film, unlike the other novice "Surf Girls." Though she's modeled for years, splitting her time between Los Angeles and Hawaii, this is Lake's first film and the only one she's ever auditioned for. "I always wanted to act, but I couldn't handle the acting classes ... too boring. I suppose this is one of those stories that irritate people who have been trying their whole life to get into film." The grueling 12-hour days and six-day workweeks were a shock to Lake, but sharing a Sunset Beach house with co-stars Bosworth and Michelle Rodriguez, who starred in "Girlfight" and "The Fast and the Furious," has been "incredible." "We have honestly become close friends even though we work together all day long and are in the same house at night," Lake said. "We understand what each of us are going through. We're probably too tired to argue." After filming is completed, Lake will return to L.A. to find an apartment, then take a vacation. "Definitely a surf trip to Australia or Indonesia or somewhere exotic," she said. "Even though this is a surf film, I've never surfed so little in my life." The "Untitled Surf Movie" is slated for release in July.